Arizona-based inbound marketing agency, Prism Global Marketing Solutions, a HubSpot Gold Partner, receives 2nd consecutive HubSpot Impact Award for Integrations Innovation. Through the use of HubSpot, paired with integrations like GoChime, we can deliver additional value at many levels of the organization, integrating marketing with the strategic goals of the business. Prism Global Marketing Solutions, a HubSpot Gold Partner in Phoenix, AZ, is excited to receive the Q1 2016 HubSpot Impact Award for Integrations Innovation. This award recognizes creative uses of HubSpot, in addition to HubSpot’s featured integration partners, to deliver value, return on investment, and innovative marketing campaigns for their clients. This is the 2nd consecutive time Prism Global Marketing Solutions has received this prestigious award. "Prism Global Marketing Solutions has set an example for how businesses everywhere should be transforming their marketing with inbound. Their strategic approach to attracting, engaging, and delighting customers has not only built valuable relationships with their audience, but has driven growth for their agency and the inbound movement. Our team here at HubSpot is proud to call Prism Global Marketing Solutions a Partner and recognize them with this Award," says Patrick Shea, Director of Channel Marketing at HubSpot. Prism Global Marketing Solutions utilizes HubSpot’s featured integrations with many of their clients. The work featured for this award was with their client, Agricen, a Loveland Products Company, an agricultural technology company delivering biochemical-based solutions for efficient and sustainable plant nutrition. The integration used was GoChime, a social and paid search re-marketing platform that integrates directly with HubSpot. Agricen was seeking a solution to leverage their highly-engaged audience on Facebook to increase their lead generation, webinar registrations and overall branding on the Facebook platform. For this reason, the HubSpot integration with GoChime was a great fit to target very specific audiences with content specifically targeted to them. 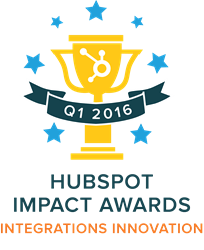 “We are honored to receive the HubSpot Impact Award: Integrations Innovation for Q1 2016. We feel that HubSpot’s featured integrations add significant value to our clients at various levels of attracting, converting, closing and delighting their customers. Through the use of HubSpot, paired with integrations like GoChime, we can deliver additional value at many levels of the organization, integrating marketing with the strategic goals of the business,” said Elyse Meyer, Founder of Prism Global Marketing Solutions. Read the complete article to learn more: Case Study: Agricen Drives 495% More Webinar Registrations & 617% Increase in Facebook Clicks with GoChime and HubSpot.